At their most basic, any time-measuring device — whether it’s a longcase pendulum clock, or the most sophisticated cesium fountain atomic clock — is simply a machine for measuring the frequency of an oscillator. A mechanical oscillator works because of two opposing forces: the restoring force, which attempts to bring the oscillator to rest, and the displacing force. The interaction between these two forces gives the oscillator its natural frequency, and if the two forces are directly proportional — that is, if the restoring force “pushes back” exactly as hard as the displacing force pushes — then the system is isochronous, which is to say that no matter how large or small the amplitude of its oscillations, they will occur in the same time period. Such a property is indispensable for an accurate timekeeper. So much for ideal systems: the reality is far more challenging. The closest approximation to an ideal mechanical oscillator is the hyper-accurate pendulum regulator clock, in which a pendulum (often of Invar, to avoid changes in length due to alterations in temperature) beats in a vacuum chamber, is impulsed electrically and is mounted on synthetic gem knife-edge pivots. Such exotic clocks, which are best kept in vaults mounted on massive, vibration-damping foundations, where the temperature is not allowed to vary, can keep time better than anything short of an atomic clock — to within a few seconds’ accuracy per year. The great care that has to be taken to achieve such accuracy points out the factors with which a mechanical oscillator has to contend to have a stable rate, however. In a watch, the restoring force is not gravity (as is the case with a pendulum), but rather a metal spiral spring which is susceptible to changes in elasticity as temperature changes, and which is also vulnerable to the effects of magnetism. Imagine how poorly a pendulum clock would keep time if the force of gravity changed every time the temperature varied, and it’s easy to see just how difficult it is to make a mechanical watch with rock-steady rate stability. Today, watchmaking is undergoing a quiet revolution in which advances in materials and design are yielding a whole new family of oscillating mechanical systems, whose higher frequencies — and, in many cases, invulnerability to the effects of magnetic fields and temperature changes — not only promise hitherto impossible levels of accuracy in watches, but are also revolutionizing that most popular of complications, the chronograph — allowing events to be timed to ever-finer fractions of a second. The Seiko Spring Drive watch is billed by Seiko as “the world’s most accurate mechanical watch”. There’s no battery — the Spring Drive watch is driven by a mainspring, which drives a conventional gear train identical to that found in any other mechanical watch. It’s at the end of the gear train that things get interesting; instead of a conventional balance, there’s a glide wheel, turning eight times per second, whose rotation allows it to act as a generator powering a quartz timing circuit. This, in turn, feeds back to the magnetic coil that brakes the glide wheel’s rotation and controls the number of times per second that it rotates. It’s an extremely efficient and unusual exploitation of the vibrational properties of quartz, and it points out the fact that despite the battery or capacitor systems usually associated with it, the quartz crystal is in fact a mechanical oscillator — albeit one that, in a watch, vibrates at 32,768Hz. The basic system of a balance wheel combined with a spring and driven by a lever escapement powered by a mainspring is still used in some of the most cutting-edge watches made today, but with major advances in resistance to magnetism as well as much higher frequencies now possible thanks to the widespread adoption of silicon parts. 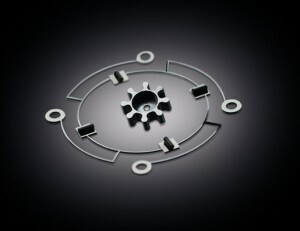 Silicon fabrication technology borrowed from the semiconductor industry proved difficult to adapt to watchmaking at first. One major problem was that of thickness — making parts with high vertical walls was a challenge not overcome until a few years ago. Another challenge was temperature — silicon is immune to magnetism, but silicon balance springs vary in elasticity depending on temperature, and silicon oxide surface coatings had to be developed to provide temperature compensation. With these problems met, however, watch manufacturers could turn their attention to making mechanical watches with silicon components — balance spring, lever and escape wheel — that avoided the need for lubrication on the impulse surfaces required by conventional watches, and which also offered the potential — thanks to their low inertial and extremely smooth surfaces — to dramatically increase the frequency of the balance. The two most remarkable efforts so far have come from Chopard and Breguet, which at this year’s BaselWorld showed watches beating at 8Hz (57,600vph) and 10Hz (72,000vph), respectively. The Breguet Classique Chronométrie also incorporates the use of magnetic bearings for the balance staff, which not only aids in reducing friction at the balance staff, but also means that the amount of friction doesn’t vary between the vertical and flat positions — in essence, offering the same advantages as the tourbillon. Probably the biggest incentive for advances in oscillator frequency is found in the design of chronographs, where higher frequency offers the very tangible and, to the user, notable benefit of being able to divide the second into smaller and smaller fractions. 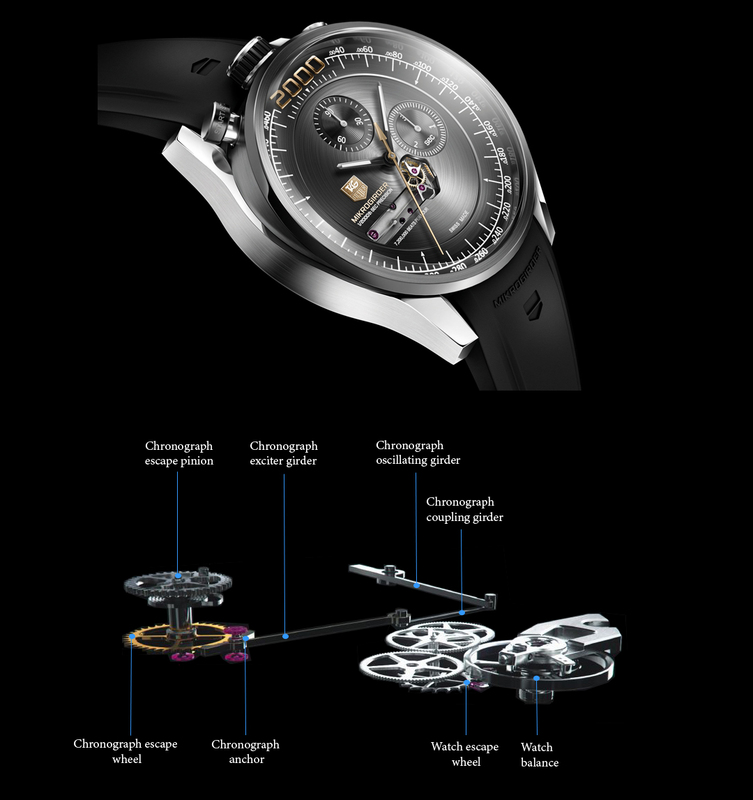 In the creation of fast-beat chronographs, the trail was of course blazed by Zenith with the El Primero chronograph, which beats at 5Hz (36,000vph). That was in 1969. In 2012, there are dizzying advances in mechanical-chronograph technology that allow, for the first time, mechanical chronographs to meet or even surpass existing quartz chronographs in resolution. Perhaps the most unusual of these is the Mikrogirder oscillating system shown by TAG Heuer in the chronograph of the same name. The Mikrogirder dispenses with the oscillating system that has been the mainstay of watches for centuries: the balance and hairspring. 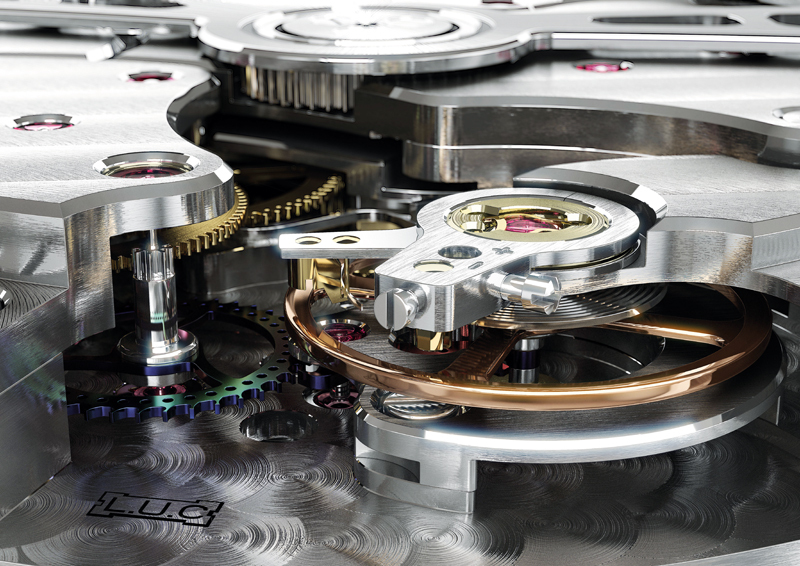 It’s possible to construct balance and spring systems capable of beating, reliably, up to 100 times per second — this was in fact first achieved by TAG Heuer in its Mikrograph stopwatch in, astonishingly, 1916. The TAG Heuer Mikrotimer Flying 1000 wristwatch is capable of timing intervals as small as 1/1,000th of a second, by dispensing with the balance entirely and using a very stiff spiral spring interacting with a lever and escape wheel. The basic problem with using a balance and spring is that to get a higher frequency, the spring has to be made increasingly stiff and short, and at a certain point the entire system simply becomes too incompliant to function. It’s to overcome this problem that the Mikrogirder 2000 system was developed. Rather than using a spiral spring, the Mikrogirder uses a very thin blade spring with a very small angle of vibration that vibrates at a breathtaking 1,000Hz (7,200,000vph), allowing the watch to achieve a record in chronograph resolution — 1/2,000th of a second. These vibrations control the locking and unlocking of an escape wheel and anchor. Of the concept watch systems shown by TAG Heuer in recent years, it’s the Mikrogirder, surprisingly, which seems to offer the fewest obstacles to full-scale series production. The system is simple, robust and elegant, with the major problem to solve simply being that of making the oscillating blade spring to the necessary precision consistently, over a large production run. Though the silicon oscillators used by Breguet and Chopard are indeed radical reinterpretations of the balance and spiral spring combination, the basic principle is still fundamentally the same as it was when Christiaan Huygens and Robert Hooke did their pioneering work in the second half of the 17th century. Though using silicon components has allowed for dramatic improvements in the resolution of such systems, they have also shown that there are inherent limits to the frequency at which such a system can run, even with cutting-edge materials. To address such limitations in a chronograph was the motivation behind the TAG Heuer Mikrogirder 2000 — however, that watch has two separate oscillators. The vibrating blade spring controls only the chronograph train, while the timekeeping train is based on a conventional balance and spiral-spring oscillator. with a sinusoidal toothed periphery that interacts with permanent magnets, which themselves are part of what De Bethune refers to as an acoustic oscillator — essentially a vibrating membrane capable of a very wide range of natural frequencies. De Bethune’s research shows that these resonators should be capable of frequencies from, at the low end, 20Hz to, at the high end, an astounding 20,000Hz. On 8 December 2011, De Bethune demonstrated a working prototype vibrating at 926Hz. Remarkably, De Bethune has “open sourced” the technology, preferring, the firm’s Denis Flageollet states, to make the results of their research available in order to encourage further development of the system. As De Bethune points out in the material it’s produced to explain the Résonique system, the use of a sinusoidal magnetic escapement system is not new, having been researched by, among others, Horstmann Clifford Magnetics Ltd. in the late 1940s and early 1950s. Vibrating tuning-fork systems are significant conceptual predecessors cited by De Bethune as well, and include not only the famous tuning-fork movements made by Accutron, Omega and others, but also similar systems used in clocks by Louis-François Breguet in the mid-19th century. The combination of a magnetic escapement system with an acoustic resonator, as well as much of the specific configuration and geometry of the resonators themselves, is, however, at the cutting edge of research into mechanical oscillators in modern watchmaking and has, as far as we know, no real precedent in watchmaking. While there are still many obstacles to be overcome before such a system can be made practical in a series-produced watch, it’s one of the most promising in development. While high-speed chronographs have reached what appear to be their practical limit, the introduction of kilohertz-range, non-quartz mechanical oscillators into the primary timekeeping train of the watch promises at least the potential for one of the biggest revolutions in watchmaking since balance first met spring.